Learn how to use Single Sign-On (SSO) to access your At Your Service Online (AYSO) account. 1. Register for SSO and AYSO accounts. If you have valid SSO and AYSO accounts, proceed to step 2. 2. Log in to UCSD's link to AYSO. Go to AYSO using this URL: http://ayso.ucsd.edu. If you're already logged into SSO, you won't see the SSO log-in screen. Proceed to step 3. 3. 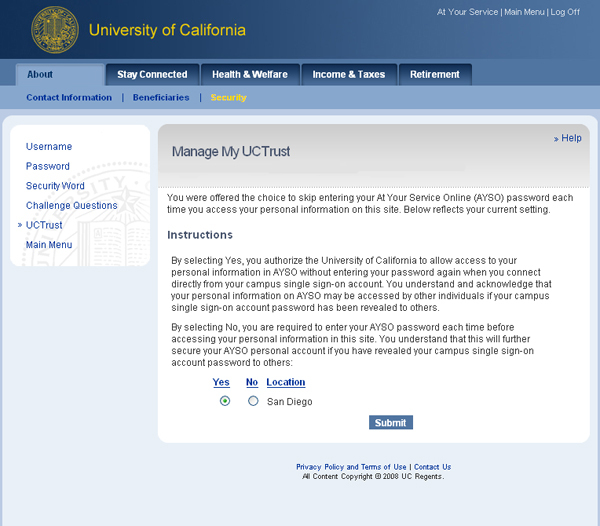 Complete the UC Trust Validation information, if prompted. 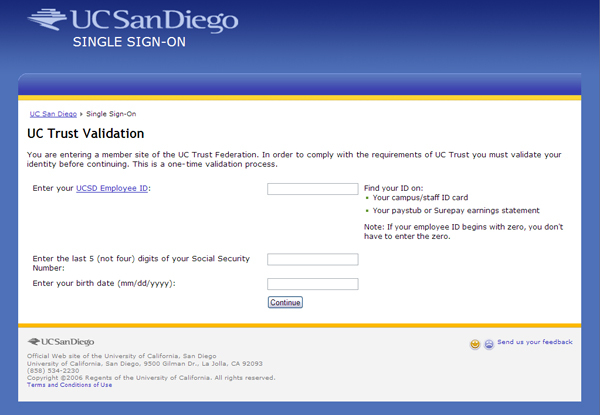 If you don't see the UC Trust Validation screen shown below, proceed to step 4. Note: If you've entered the correct information and the system does not recognize you, contact your benefits representative to verify your information in the employee system. 4. Complete the AYSO sign-in screen. At the AYSO sign-in screen, enter your AYSO password. 5. Choose how to access AYSO in the future. 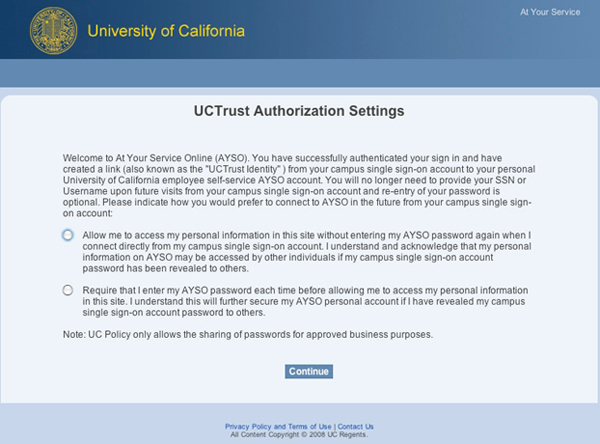 On the UC Trust Authorization Settings screen shown below, you'll see 2 choices for accessing AYSO in the future. To log into AYSO with your SSO, click the first radio button. This enables you to navigate between UCSD business applications and AYSO using just your SSO. To enter your AYSO password every time you access AYSO, click the second radio button. You'll need to enter your AYSO password anytime you access the site, even if you're logged into SSO. 6. Manage the feature from AYSO. In the About section, click My Security Preferences. Review the instructions, and click Yes or No to update your access preference.